First a bit of housekeeping: Sorry to those that were looking for a Podcast and exit interview last week with Jeremy. I had every intention to bring it to you, like normal, on Thursday afternoon, but CBS unexpectedly (there’s that word again) cancelled my exit interview with him at the last moment, and wasn’t able to reschedule it for me. It was a bummer, because it sounds like Jeremy had brought some bombshell allegations to his press interviews that caused quite the stir all over social media. Maybe that’s why they cancelled some of his press? Either way, it was disappointing, but such things happen. It appears as if I won’t be chatting with Jeremy Crawford this season. But as fate would have it, where I didn’t have an exit interview last week, I will have two this week (at least, if CBS comes through with them for me)! We were given some foreshadowing last week of Bi‘s knee injury, hurt during the Immunity Challenge. It turns out that Bi has a sprained MCL, a serious problem considering that Bi makes her living as an MMA fighter, and would be taking a big risk to even more severe injuries should she stay in the game. Jeff Probst removed all doubt and made it quite clear however, that this is not to be considered a “medical evacuation,” but rather, this was a quit. Bi was not told by medical that she needed to leave the game, it was in fact, her own decision to do so. That puts Bi in the unglamorous position of taking up ranks in the Survivor Hall of Shame (aka Survivor Quitters), although most quitters have done so not due to medical injury (although it has happened), or to a specific case where their outside livelihood might be threatened. I don’t know, should Bi be shamed, or was this a respectful way to leave the game? You decide. New Orange. Yep, I don’t care and refuse to mention these tribes by their names…it’s a Survivor tradition sure, but enough with the Tribe names! Just call them by their colors! But I digress. So the “new Orange” tribe went to Tribal, putting Alec‘s utter stupidity on display for a nation-wide audience. I’m sorry, I usually try to pull punches and be a bit more cordial in my critiques of game-play, but man, Alec voting out Natalia was such a terrible, terrible play. First off, this was the very first Tribal following the swap, so another swap or the merge happening are still probably many days away. 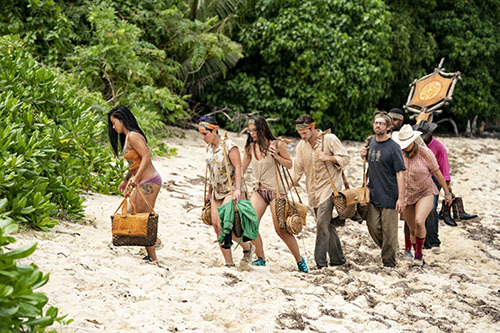 With Carl coming back to their tribe in Natalia’s place, Alec essentially voted himself into the minority on his own tribe, simultaneously ending Kara‘s game along with his. Poor Kara, who has been a likable contestant with lots of potential (especially with her social game-play), is now effectively done, and it’s no fault of her own. So the question becomes: What the hell was Alec thinking? My wife seems to think it had something to do with the fact that maybe Alec didn’t like taking orders from strong women, and we definitely saw Natalia’s paranoia lead to some forceful talk back at camp. Could it be that simple? Did Alec just overthink things? Boy oh boy, this, I assure you, is not going to end well for Alec. New Green. I truly believe there are Survivor Gods…how else do you explain the fact that they were able to keep the geeky love-birds Christian and Gabby on the same tribe post-swap? It was heart-wrenching to see Gabby lose all confidence, but it was equally heart-warming to see her relationship with Christian continue on. Theirs is the most satisfying show-mance I believe I’ve ever witnessed, and it’s only been four episodes. I find myself saying “aaaawwwww” way more than a grown man should whenever their on-screen together. Watching Christian wipe away her tears…I’m not crying, you’re crying! All we can do is hope that the Green tribe continues to win until Gabby and Christian reach the merge, otherwise, they will almost certainly be separated. Of all of the new tribes, and despite Christian’s ability to befriend the other guys on his new tribe, this group of Goliaths seems impenetrable. New Purple. Lyrsa and Nick found themselves as the only two Davids on the new Purple tribe, but wherever Napalm Natalie is, there’s hope. We got another glorious scene of Natalie ordering others around the camp, this coming just days after her Tribal Council where she apparently learned some “self-awareness.” They continue planting the seeds that Natalie will not be long for this game, but she continues to defy the odds. 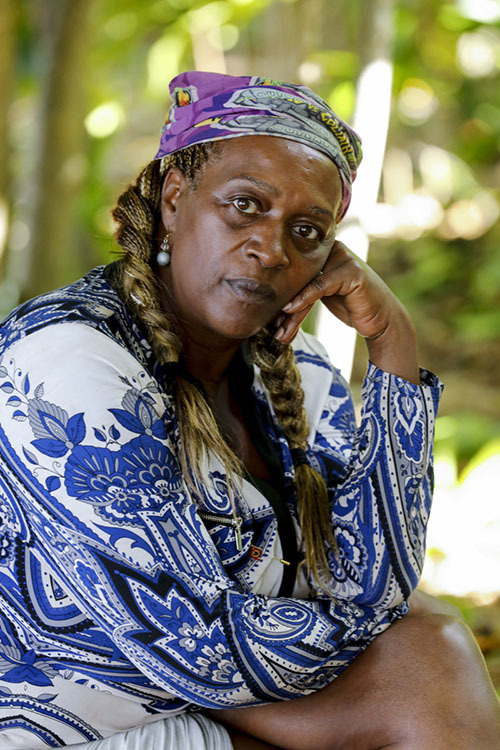 Ladies and gentleman, she’s only a few more Tribals away from making jury, and if she reaches that point, she becomes a prime candidate to go even further, given the fact that NATALIE HAS NO CHANCE OF WINNING THIS GAME. The Nick/Mike “Rockstar” alliance may have been one of the more important yet subtle developments of the night, but let me add that I desperately think that Nick still, has confused Survivor with Big Brother, as naming alliances is not really a thing that fans of Survivor do. Exile Island. Not to be lost in all of this, we got to see Carl on Exile Island! First off, I had not heard that Exile would be a part of this season, so there’s that. 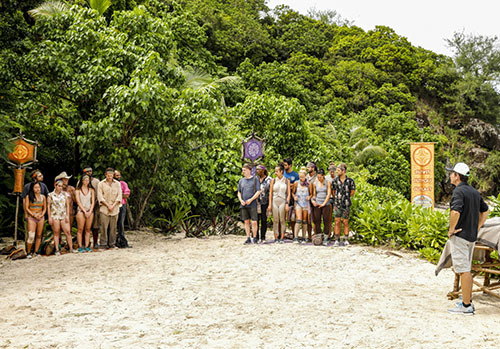 But more importantly, we got to see the newest Survivor twist: The Idol Nullifyer, an advantage that can be played on a specific person – secretly while voting – that nullifies any hidden Idols that would be played on that person. It’s a cool concept, one in which we will have to wait and see how it plays out. Episode Take-Away: This for me was the best episode yet of the season. I liked the excitement of the tribe swap, although I was initially a bit bummed to see how the Goliaths held the majority at all three of the new camps. But I’m still really digging this cast. But talk about an episode having it all: We had a person quit, a tribe swap, the introduction of Exile Island and a new game advantage, a pretty awesome Immunity Challenge that came down to the wire, and then an explosive Tribal Council that included whispering, confusion, Probst smiling and a great blindside…not to mention one of the more “angry” exits we’ve ever seen. Alec all but ended his game, but man it was fun watching it burn. Next Week’s Episode: We see the aftermath of Tribal, as Alec tries to tell Kara that he just was following his gut…well it definitely wasn’t using his head. And breaking news: Natalie is still being a major pain. But the story next week looks like it might just be the storm itself…the worst weather in the history of Survivor this season continues to show us just why it has gotten that reputation. Quick Note! I appreciate that you are reading this Recap! But all season long, remember to return right here to Reality Tea for my FilmSurvivor Podcast on Thursday, where you can listen to my full exit interview with the eliminated contestant. This week I will have TWO exclusive interviews with Bi Nguyen and Natalia Azoqa. Those that have followed me also know that I am a RottenTomatoes-approved film critic, and I encourage you to check out my weekly movie reviews (like “Halloween,” and “The Oath” this week) as I am also the national film critic for AXS.com and am a movie critic/TV personality in the Detroit area. As always, the easiest way to get all of my Survivor coverage and movie reviews is to follow me on Twitter – @tomsantilli – or on Facebook. TELL US – WHAT DID YOU THINK OF TONIGHT’S EPISODE? WHAT ARE YOUR THOUGHTS ON BI QUITTING? AND DID ALEC MAKE THE RIGHT DECISION IN VOTING OUT NATALIA? Below Deck Recap: Ralph And Rally!